Remember the old fashioned ‘I Spy’ books? The ones where you had to search a cluttered room to find certain, well-hidden objects? Now, there’s a children’s app for that and its perfect for your preschooler! Released just yesterday from the developers at Sesame Street ( our personal favorite!) comes a brand new app featuring your favorite furry, red monster. I bet you can guess who? ‘Look and Find Elmo’ features 6 exciting, searchable scenes in which little ones will assist Elmo in finding 90 carefully hidden objects. As children search for Elmo’s missing things, he pops up and offers words of encouragement and advice to keep children enthused and focused. 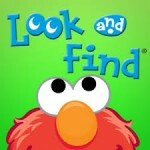 Outside of simply searching for Elmo’s missing items, this app sports a few other fun features and games as well. 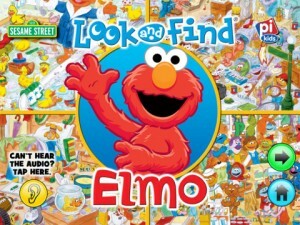 Look and Fine Elmo also allows kids to find and collect an additional 15 items through a fun ‘virtual sticker-book’ feature. Each scene contains 3 ‘Super-Duper Stickers’ that animate when children touch them. Once activated, the Super-Duper Stickers are added, automatically, to the child’s Super Duper Sticker Book. The Look and Find Elmo app also contains a traditional memory game , thrown in for bonus fun. In this feature, kids touch or tap a series of cards to flip them over and find matches. This app is perfect for children who enjoy Sesame Street’s lovable characters as well as a the challenge of a look and find game. Elmo turns this traditional game into a fun and familiar romp down Sesame Street. Complete with fun Sesame Street music and sound effects, Look and Find Elmo is the perfect mix of brain-bending puzzle and fun! The Look and Find Elmo app is available for download via the Apple iTunes App Store for only $0.99 via the button below. The app is available for both iPad and iPhone/iTouch and requires iOS 4.3 or later to operate.